HOWLEY Hall’s James Appleyard and Miles Foster lead by three points going into the final day of the Yorkshire Challenge. After placing first on day one at Moortown with 44pts they amassed the same score at Lindrick to finish top for the day again and – at Ganton on Friday – will chase a clean sweep of daily honours as well as the Supreme Champions title in the annual event staged on the county’s three Ryder Cup courses. But in their rear view mirror they will see the menacing sight of Yorkshire county player and Bernard Darwin Salver holder Bailey Gill and his Lindrick club-mate Julian Maturi. They prevailed at Moortown with 42pts on day two on countback from Hessle’s Ian Cook and Nick Patey having begun with 43pts at Ganton. Bawtry’s Neale House and John Davies, who added a 40 at Ganton to their opening 44 at Lindrick, share overall third place on 84pts with first-round leaders Ryan Gill and Mark Corker, of Wath, who came in with 36pts at Moortown after starting with 48 at Ganton. Turton’s Adam Bullough and Mark Rothwell won on day two at Ganton with 42pts on countback from Graeme Walker and Yuseph Hedar, from Shipley Beckfoot. New overall leaders Appleyard and Foster had a tame beginning at Lindrick, with five points from the first three holes, but carded three birdies in the next six and half a dozen more on the back nine. Gill got his and Maturi’s round off to an eagle start at Moortown and after Maturi birdied the sithx they had four more birdies coming home. Defending champions Kevin Walsh and Gary Young, of Knaresborough, are on 76 after scores of 39 at Lindrick and 37 at Ganton. 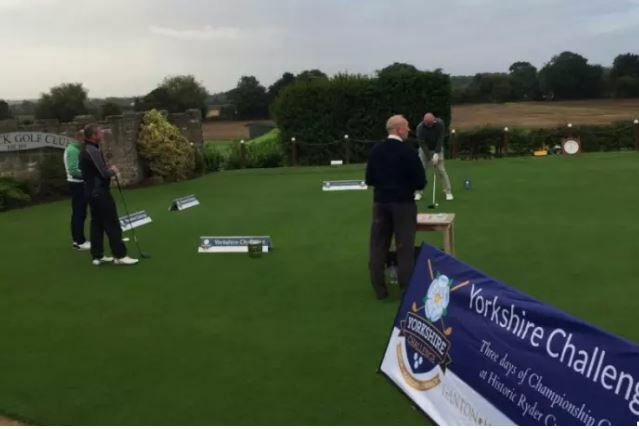 On the final day of the Yorkshire Challenge, £5,000 is up for grabs for a hole in one; at the 18th hole at Lindrick, the fifth hole at Ganton, and the 10th hole at Moortown.